Highlights include person-to-person transmission of the NCov, new drug to stop drug-resistant flu, plant viruses: yes they exist, sweat more to prevent TB, blacklegged ticks are spreading an unnamed disease (blackleggedia? ), and did the meteor bring a virus which will kill us all? More news to come. Happy Friday! Note: No updates on the deaths of two people in China from H5N1 – the cases were of particular concern due to the inability of health investigators to establish connections between either case and infected poultry. Person-to-person? We’ll keep you posted. The UK patient infected with the novel coronavirus (NCov) after travelling in the Middle East has died, raising the number of deaths to seven (out of thirteen known infections). The virus was not thought to be contagious until two family members of the sickened UK patient also became infected. One of the reasons why the Influenza viruses are so difficult to handle is their phenomenal ability to mutate. Due the prevalence and high infectivity of the viruses, drug resistance is understandably a cause for serious concern. A group of University of British Columbia researchers are seeking to mitigate this concern by developing drugs which inhibit neuraminidase binding in drug-resistant strains. Plants don’t get a lot of attention here at GMU Biodefense, which is unfair because they’re so prevalent. Plants have feelings too, right? Well no, but they can still catch viruses. So I have some bad news everyone. Apparently in addition to making you happier and prolonging your life, exercise may also save you from TB. Or, to be explicit, the secretion of the natural antibiotic dermcidin in sweat effectively kills bacteria which may enter at open cuts or wounds. The bad news? This makes avoiding exercise that much harder. Blacklegged ticks are well established vectors for Lyme disease. However, the arthropods are now apparently carrying a recently discovered bacteria, Borrelia miyamotoi, which causes an as-yet-unnamed disease. The bacterium was first found to be pathogenic to humans in 2011, with the first US cases occurring in New England in January of this year. It’s now been found on the West Coast. 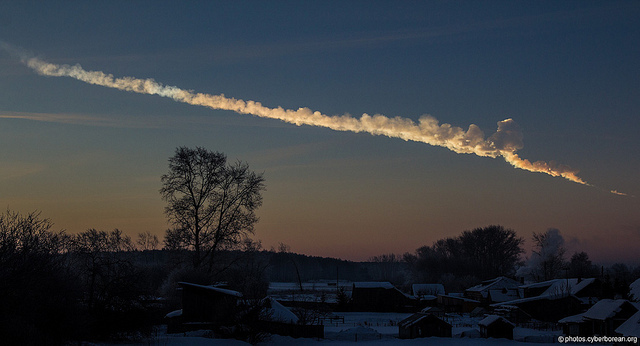 Oddball Piece: Chelyabinsk meteor brought a dangerous virus to Earth?